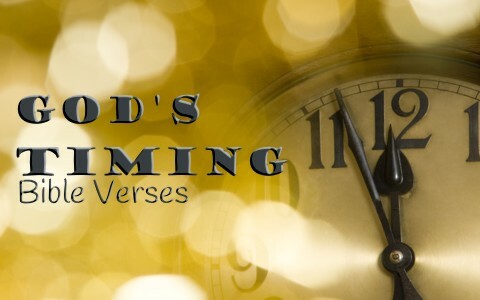 Here are eight Bible verses that refer to God’s timing or divine timing, if you will. This verse comes after Habakkuk had just complained about all the injustices saying “Is he then to keep on emptying his net and mercilessly killing nations forever” (Hab 1:17) so God’s answer was there is an appointed time for it Habakkuk. It will not hasten to the end until God determines the time is perfect. God reassures Habakkuk to trust in God’s judgment and to “wait for it; it will surely come” and “will not delay” meaning God’s timing is always perfect. This is the greatest of all timing for our sake because it Jesus came at the fullness of time, meaning that it was at the exact time when all things were fulfilled. Only then did God sent His Son to redeem those who were under the curse of the law. God did this so that we might be redeemed and then adopted (Eph 1) and become the children of God. This verse also refers to God’s timing since when we all stood guilty before a holy God, and having fallen infinitely short of His glory (Rom 3:23) Christ died for the ungodly so it was “while we were still sinners, Christ died for us” (Rom 5:8). The question is will we believe that He died for us and even though we still sin (1 John 1:8, 10; Rom 3:10-12), will we repent and trust in Him? Waiting is one of the most difficult things we humans do. We wait in line at the store, we wait in hospital waiting rooms, we wait in line for our license; we wait for our dentist or doctor’s appointment….wait, wait, wait! But wait (sorry), we must wait for the Lord or wait for His timing. To move ahead of God’s divine timing is to take matters into our own hands. To lag behind God’s timing is to miss out on His blessings. No wonder those who walked with God knew how to wait…someone who’s walking with God is close enough to Him to see that they might have to wait and has the wisdom of knowing how to wait patiently. Have you ever seen an eagle soar? They seem to fly effortlessly, gliding high in the heavens with little or no effort to stay there. That’s a great image of God. We can soar above the storms if we wait on Him and if necessary, we can pass through the storms being mounted “up with wings like eagles.” In this way we can walk without fainting because God will renew the strength of those who wait upon Him and wait for His perfect timing. Since we know that God is completely sovereign over time and for the timing in our life for that matter, we can say with confidence “there is a time and a way for everything, although man’s trouble lies heavy on him” (Eccl 8:6) since “For everything there is a season, and a time for every matter under heaven” (Eccl 3:1). Depend on God’s timing to be perfect, even when we’re not. This should encourage those who love the nation of Israel and the Jews. God is certainly not finished with His people but He is waiting for the perfect time, the time when “the fullness of the Gentiles has come in.” Does this mean that God will wait until the very last Gentile (non-Jew) is saved before opening the eyes of the Jews? All I know for sure is the “hardening has come upon Israel” but only “until the fullness of the Gentiles has come” and we don’t know when that will be. When God made some of the most amazing promises to Abraham, it was the smaller thing’s for God to do that seemed impossible for Abraham and Sarah too accept. That was Abraham and Sarah would surely have a child. Sarah even laughed about the promise, indicating a great amount of doubt in her heart but Abraham had doubts too as to whether he and Sarah would bear a child in their old age. God had been telling Abraham this for years yet nothing ever happened. Abraham had to wait a very, very long time but in His immaculate timing, God came through and Isaac was born. Of course He did! He is God. I pray these verses can give you some hope that God’s timing is always best. Only He can open doors that no one else can. It’s best not to try to kick the doors open like I’ve done before. That’s a bad plan. May we both give glory to God in trusting Him in all things and waiting on Him, knowing that whatever happens and whenever it happens, it will always work out for the best of those who love God and are called according to His purpose (Rom 8:28). Something else that might interest you: Why Does God Wait to Answer Prayer? Amen , this article is a blessing. Thanks for this article. It was a blessing. Next post: How Does The Bible Define Perseverance?